Crowhurst Park’s cricketers were just one wicket away from victory against a Lindfield side which had won its previous seven league matches. 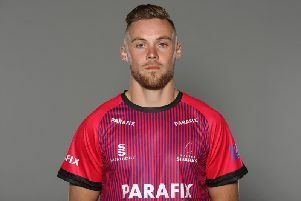 Dale Payne scored a magnificent unbeaten hundred as Park outplayed their opponents in what was a Sussex Cricket League Division Two bottom versus top encounter at the start of play. After winning the toss and choosing to bat, Park openers Payne and Nick Taylor took the score to 60 before Taylor (28) was caught in the slips. Park then slid to 72-3 and 95-4 before Payne was joined by Clive Tong. Both looked settled, with Payne passing 50 for the first time this season, until Tong (16) was caught. Park encountered another mini collapse, losing their next three wickets for just 18 runs to sit 158-8. Paul Brookes joined Payne still hopeful of achieving maximum batting points, with Payne stroking the ball to all parts of the ground. He achieved a much-deserved and well-timed first league century for the club before Brookes was caught with the score 186. Park got to 200 in the final over. Payne batted throughout the innings to record a memorable 113 not out, which was paramount in Park setting a competitive target of 205-9. Pick of the bowlers were Hayden James (17-5-65-2), Matthew Wilson-Yelverton (18-1-65-4) and Stephen Pearce (10-2-32-3). Park picked up a wicket in the third over of Lindfield’s reply, Phil Weir caught at cover point by Fox Parker off Brookes. Both opening bowlers settled into a good rhythm and frustrated the batsmen. A fine spell from Brad Payne was capped by hitting the top of off stump to remove Geoffrey Lawrence. The drinks break brought about a surge of runs, but Park continued to bowl good lines and Tong rearranged the stumps of Shane Wilson-Yelverton (27). Brookes struck twice in successive balls to leave Lindfield 129-5, which soon became 139-6 when Tong took the crucial wicket, bowling Tom Howard for 76. Matthew Wilson-Yelverton followed next over to a fine running catch from mid-off to mid-on by a jubilant Brad Payne. Lyle James (10) lost his off stump with the score 149 and Pearce’s patience was undone when Brookes bowled him for 17. Park battled hard, but were unsuccessful in taking the last wicket, Lindfield finishing on 172-9. Brad Payne finished with 11-3-39-1, Brookes 23-7-69-5 and Tong 13-1-52-3. Standings (all played 11 matches): 1 HASTINGS PRIORY 261pts, 2 Lindfield 253, 3 Worthing 217, 4 Three Bridges 217, 5 Pagham 196, 6 Findon 190, 7 St James’s Montefiore 181, 8 Ansty 159, 9 Ifield 156, 10 CROWHURST PARK 88.